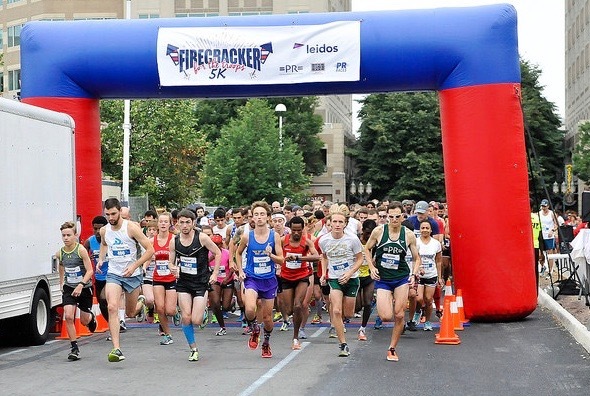 After stalking the weather forecast for the last few days leading up to Independence Day, I ran in the seventh annual =PR= Races Firecracker 5K hosted by Potomac River Running and Leidos on the morning of July 4th. It was my fourth time running this fun race which has become one of my favorites. 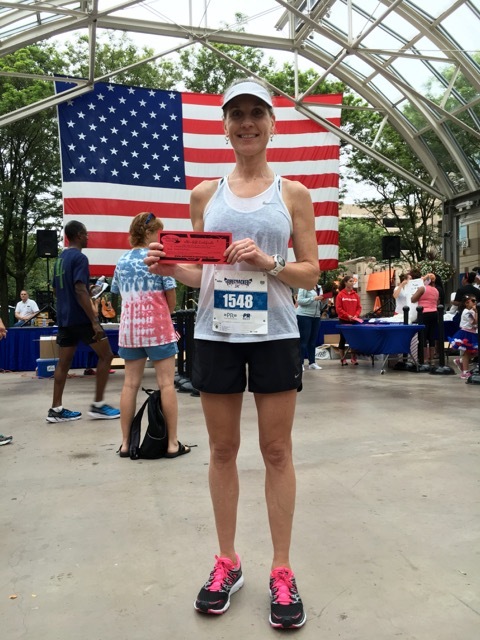 In a bold move for me, I wore a skirt – yes, you read that correctly, I raced in a skirt. 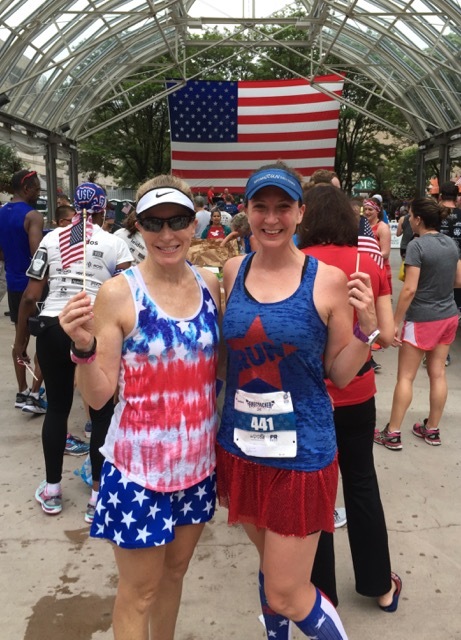 I’d purchased a very patriotic blue and white stars skirt and matching stars and stripes spandex shorts (affiliate links), to wear as part of my Ragnar Trail Richmond “uniform” with the intentions of also wearing it for my annual Firecracker 5K. Once I found the adorable tie-dyed style tank at Walmart for $7.88, I knew that I had to wear the skirt to complete the outfit. BTW, the only size tank they had left was XL, but I liked it so much I bought it anyway and remade it so that it was the perfect fit! Erin and I rode to Reston Town Center together and showed up in time to hit our first of several bathroom stops before the race. 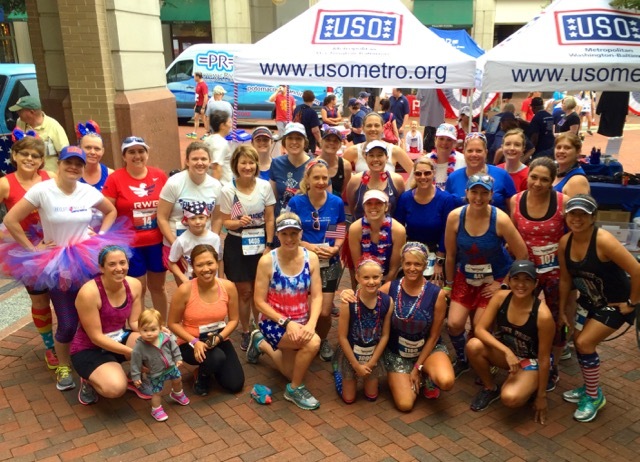 With temps pretty agreeable for a July race and the threat of rain holding off until early afternoon, we headed out for a quick mile warm-up before meeting our fellow MRTT friends for our customary pre-race photo. Having failed to break into the 24:00’s at all last year in the 5K distance (the closest I got was 25:04), I hoped to make it happen on this day. Spoiler alert, it didn’t happen. After saying saying my goodbyes and wishing my friends good luck, I headed off to self seed and focus on the task ahead. Surprisingly, I didn’t see anyone I knew around me in the starting chute, so I got my music started as I waited for the singing of the National Anthem. Yes, once again you read that correctly, for the second time ever I listened to music during a race. After the showing of the colors by a local high school ROTC and the singing of the National Anthem, we were off! 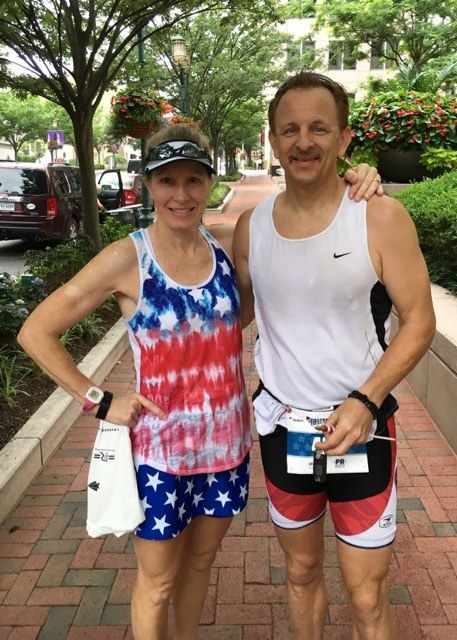 Less than a half mile into the race, my skirt started riding up under my Spibelt (affiliate link) and before I knew it, I had a blue and white spandex spare tire around my waist. It was truly a lovely look and I’m disappointed that a photographer out on the course didn’t get a picture. Assuming it would keep riding up, I didn’t want to take the time to stop and fix my less than fashionable look, so I charged on. 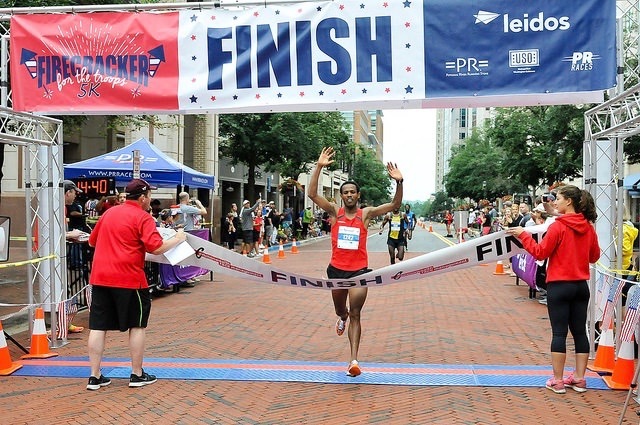 Well before I had even gotten to the second mile marker, Girma Gebre was crossing the finish line with a winning time of 14:41 (4:44 pace)! 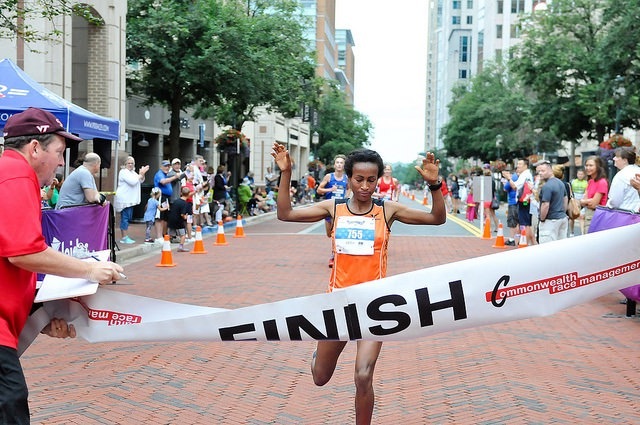 Shortly afterward, just as I was completing my second mile, Askale Merachi was the first woman to cross the finish line with a time of 16:43 (5:24 pace). Erin and I had seen her out warming up during our warm-up and correctly guessed that she just might win the women’s division. My pace felt pretty good, but I knew that I was working too hard to be able to maintain a sub 8-pace throughout the race. With a couple of uphills on the last mile, my pace slowed slightly and my sub-25 flew out the window. As I approached the last turn to head up Market Street and to the finish line, I saw a friend who I hadn’t seen in a couple of years. I shouted his name, he called out my maiden name in return (he’s the only person who calls me by my maiden name), and that gave me the little boost I needed for push to the finish line. 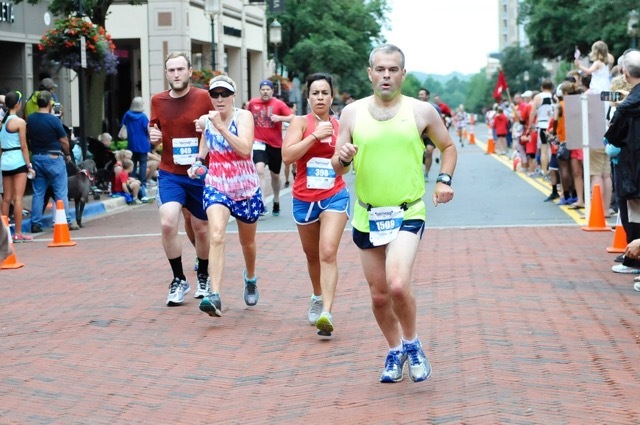 As soon as I got on Market Street, I started tugging on my skirt and got it back into place as best I could while running hard toward the finish line. A girl’s got to look her best in her finish line photo, right? As soon as I crossed the finish line and while still trying to catch my breath, Terri, the race director, walked over to say hello. We chatted a few minutes and I got to thank her for another fabulous =PR= Races event. At about the same time I spotted Erin and we headed off to find something to eat and drink; but before we forgot, we asked someone to take our picture and then we made a beeline for the food tables. There were tables set up with the typical post-race food such as bagels, bananas, fruit chews, granola bars, and cookies. 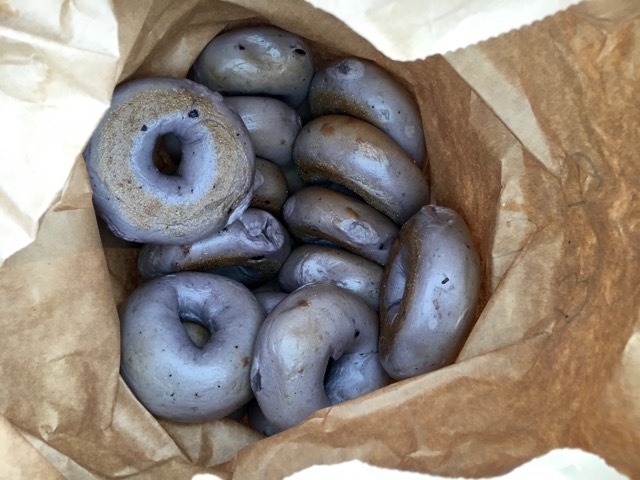 I grabbed a water and banana, and even treated myself to a blueberry bagel. 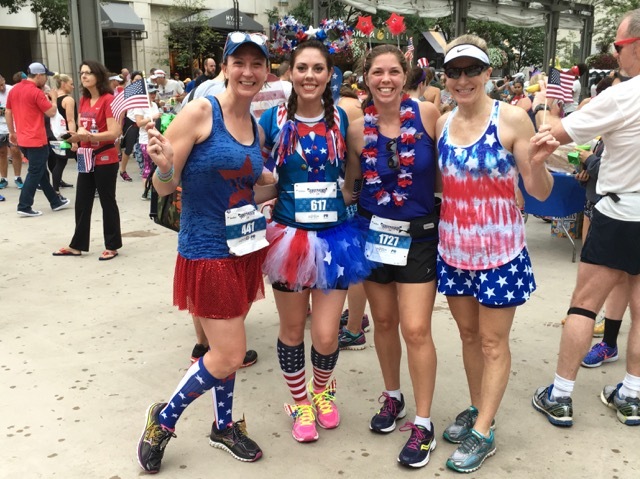 We found our MRTT teammate, Christin, and race friend, Angela, and chatted with them for quite some time. 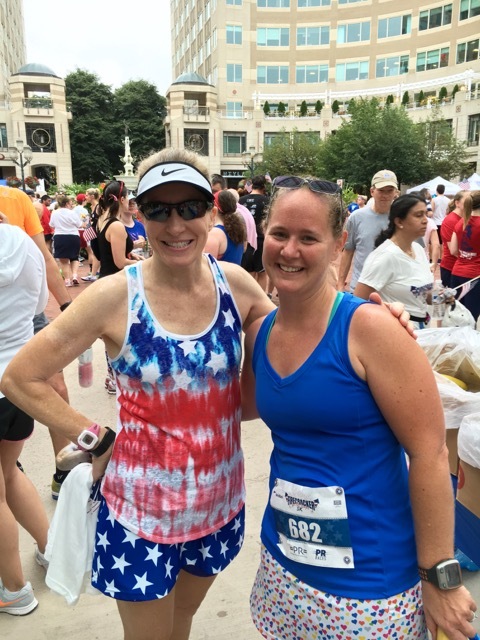 I first met Angela at the 2013 Firecracker 5K when I spotted her in an adorable race outfit and asked if I could take a picture for my race recap. Since then, we often see each other at area races and she always has on the perfect race outfit that’s very much on point with the theme of the race. While milling around, or as Erin says, “Debbie is mayoring” (but that’s a different story for another day), I bumped into Susan from Skirts and Socks. Her husband was kind enough to take our picture while we chatted and caught up. Since my race shirt was a size too large (I never know what size to order because the sizes vary depending on the manufacturer), I checked to see if I could exchange it for a smaller size. I was in luck and the ladies behind the shirt swap table were kind enough to set a small aside and save it for me while I walked to my car to get my shirt. On the way back from my car I bumped into my Cruiser friend, Jerome. He and his wife had just finished the race as well and were on their way to watch the Nationals play at noon. I asked Jerome to pose for a quick Cruiser picture, cheer extra loudly at the game for me, and then let them get on their way. Back at the pavilion, I exchanged my shirt and listened to the band for a few minutes before heading off to find my friends and the race results. My training buddy Kathy (and by training buddy, I mean that Kathy runs with me when I’m running tempo and she needs an easy recovery run) placed second in her age group with a time of 22:00. Congrats, Kathy! 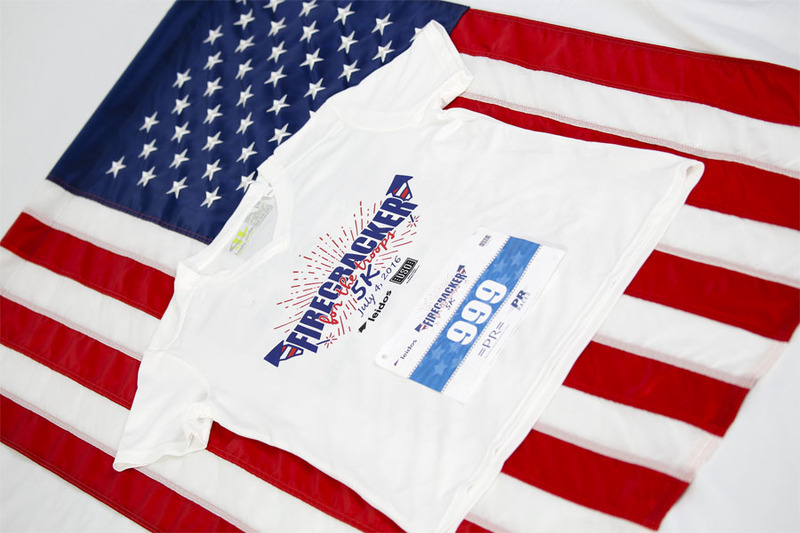 If you live in Northern Virginia and are looking for a fun way to start your Independence Day with a bang, join me in running this great race next year. Potomac River Running never disappoints! Do you listen to music during races? During training? Love all the spirited outfits!! Thank you! Usually I just wear regular running clothes, but for the Firecracker 5K and Run With Santa 5K I like getting in the holiday spirit! That’s a great finishing time! Congrats! If you hadn’t had skirt problems, maybe you would have been in 3rd place! 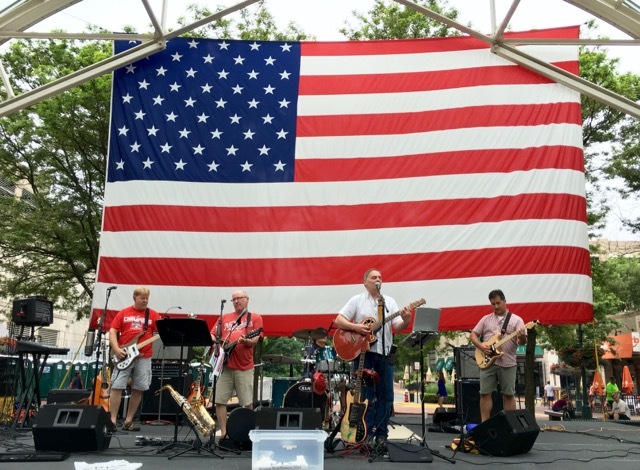 In longer races, I sometimes listen to music, but if I had been racing a summer race, I might have tried it just to get my mind off of the heat. Cute outfit! Took bad the skirt rode up. I hate it when that happens. I do not listen to music while I race but definitely when I train (only on the treadmill). I may listen to music during the marathon but we’ll see. I’ve done 20 mile runs with no music and was OK with it. I see you had a lot of fun running. I’ll consider about joining next year. I always listen to music when I’m running, it’s great. It’s definitely a fun race!